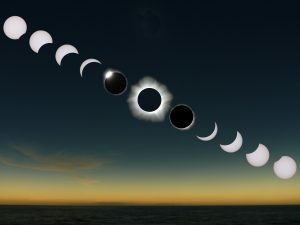 Check out my Facebook and Twitter all this month for tips and articles about eclipses. And feel free to join my Patreon or buy me a coffee if you enjoyed this article and would like to see more. I work in a planetarium and am a lifelong amateur astronomer. We astronomy geeks have been eagerly anticipating the upcoming America-crossing solar eclipse on Monday for over a year, but most people (including the media) were blissfully unaware until very recently. Questions I’ve been fielding about it have skyrocketed since August 1 and super-novaed in the past week. And it turns out the media coverage still has a few holes. So, here are my already-patented answers to the most common and important questions. 1. Will looking at the sun during the eclipse hurt me? Yes, if you look too long, but no more or less than if you looked at the full sun. There is no special, mega-destructive radiation during an eclipse that will hurt your eyes more than other times. But your eyes may be fooled by the dimmer light into “thinking” that they’re safe. Your blink reflex may be reduced. You may not be consciously dazzled by a crescent as by a full disk of sun. But yes, that can still hurt your eyes. A lot. It boils down to simple math. The sun is about 400,000 as bright as the full moon. Since the full moon is a bit dazzling but not harmful and the full sun obviously is, people understand that the full sun is dangerous to look at. Unfortunately, they then think that if the crescent moon is not dazzling or harmful, neither will be the sun. This is not so. When even 1% of the sun is visible, that’s still 4,000 times as bright as the full moon. If it’s 6 or 7 times that, as it will be here in Eastern North Carolina, that’s about 25,000 times as bright. Obviously, thousands of times as bright as an object that’s dazzling, but not harmful, is pretty harmful. It won’t strike you stone-blind if it dazzles you as you’re putting down your sun visor while driving down the road toward it, but you still need to be careful. Bottom line: The sun is only safe to view, for more than a quick glance, when it’s completely covered by the moon in the brief total eclipse phase. 2. I can’t get solar eclipse glasses. What do I do now? Welp, you’re probably out of luck with the glasses, sorry. I got some a couple of weeks ago, but I hear they’re completely sold out in my area as of this week. You can, however, view the eclipse quite safely in other ways. The best way is to find a local science museum or library in your area that is doing an eclipse party. These are generally free. Yes, there will be crowds, but we’re pretty good at crowd control (all that experience with school groups), and most should have eclipse glasses and extra equipment like telescopes with filters for safe viewing. I’ll be working the Eclipse at the Imperial Centre on Church Street in Rocky Mount, NC. Not only will we have three regular scopes with filters, but we’re breaking out the H-Alpha scope (you can see solar flares in it) and the Sun Spotter (which safely projects an image of the sun onto a piece of white paper). If you can’t make it to one of those, the absolute easiest and safest way is to make a pinhole camera. The absolute easiest way to make one is to punch a small hole in a paper plate, aim the plate at the sun, and let the image fall on another paper plate through the hole. Pinhole cameras of this type are very easy to make and there are designs all over the Web. They are also completely safe as long as you project the image onto a non-reflective surface (no mirrors or glass) and don’t magnify it through a magnifying glass or unfiltered telescope (you might burn the paper and/or damage your telescope). 3. 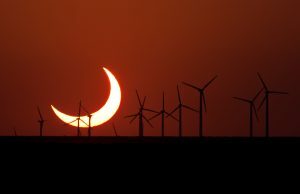 Is it worth seeing only a partial solar eclipse? I cannot stress this enough – YES, IT IS. If you have any visible eclipse action going on at all in your area, you should check it out. Even though a solar eclipse is actually pretty common (about one ever 18 months somewhere on Earth), the area covered by either the umbra (total eclipse shadow) or the penumbra (partial eclipse shadow) is so narrow, and so often over an unpopulated area like the high Arctic or the ocean, that most people have never seen even a partial eclipse. For it to cross a heavily populated area like the United States is quite rare (and it’s going to happen again on April 8, 2024, which is even rarer). That’s why it’s predicted to be the most-viewed solar eclipse in history. So, just for the historical event value alone, you should be checking it out. But in addition to all that, it’s actually worth seeing this throughout the viewing area. Which is pretty much all over the U.S. and in British Columbia. Unfortunately, the science educators kinda dropped the ball on this one and have totally undersold the value of seeing a partial eclipse, even though there’s no way most people in the U.S. and Canada can get anywhere near the umbra AKA path of totality. Most of us did not anticipate how crazy and how early the activity of chasing totality would get. There’s already traffic gridlock in some states, so it turns out even leaving very early in the morning on Monday (the plan I would have followed if I weren’t working the eclipse) may not be a good or safe option. And it’s just not worth getting stuck in traffic or even getting hurt to see the up-to-two-minutes of totality you’d get if you managed to get into the umbra. A total eclipse is very much worth seeing – but it ain’t that worth it. This is also underselling 99% of the eclipse experience, which is a partial eclipse wherever you are. I’ve read reputable science writers in astronomy guides telling people it’s not worth watching an exclipse unless it’s total. That’s dumb. This isn’t like a partial lunar eclipse, where you may not even notice the shadow if it’s small and faint enough. If the moon does more than graze the sun in your area, you will notice. The sun is just that bright and the new moon is just that dark. The thing is that the partial eclipse, whether it’s before and after the total, or partial is all you get in your area, is far more than just the experience of a few minutes of totality and lasts a lot longer. Three hours in my area, which gives you plenty of time to step outside and get a look, to check out what’s going on around you (it gets weird), and still have a look even if you’ve got heavy cloud cover much of the time. Yes, you only get to see the moon-bright corona in the few minutes of totality. Yes, you only get to see phenomena like Bailey’s Beads then. Yes, it’s the only time you can look directly and safely at the sun (though, technically, you’re looking at the moon, which is blocking the sun). But the real, and really weird, experience is watching the sun slowly disappear and reappear, and you will see this throughout the penumbral (partial eclipse) area. In the path of totality, it’s as straightforward as the moon’s phases from first to last quarter. Outside of that, you may see some odd shapes as the moon crosses part of the sun. And these will last longer than the total eclipse. Also, while you won’t see a starry sky, you could still look for Venus to the west and Jupiter to the east of the sun. You can see these two planets in the sky even during daytime, if you know where to look. Depending on how total your partiality is, you can still find them. In addition, you will get a lot of strange effects, such as a darkening (albeit still-blue) sky, weird shadows, and animals acting oddly (the birds may go to sleep). If you are near enough to the umbra, you may even be able to look in its direction and see the shadow. 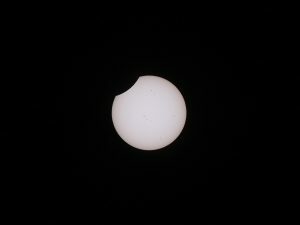 I’ve seen two partial eclipses, including the New England Christmas Eclipse of 2000. It’s difficult to explain how unnerving it is having a big, black shadow cross the sun. It is not at all like overcast weather. I’m not at all surprised it creeped our ancestors out, even in cultures where they knew how to predict eclipses. 4. Speaking of weather, is it worth watching the eclipse if it’s partly cloudy? Yes, absolutely! In fact, having a little weather may enhance your experience, especially in periods and areas of partial eclipse. The clouds will look different, for one. If it rains and you get a rainbow, it will also look different. An eclipse, total or partial, affects everything in the sky and how that light reaches the ground. And since a partial eclipse lasts much longer than the period of totality, you’ll have much longer to observe these conditions and it will be totally safe as long as you’re not looking directly at the sun. If it’s totally socked in with rain, it will be a little more boring, but you should still notice that the sky will darken even more than usual at the height of the eclipse. 5. Are my solar eclipse glasses worth keeping? Yes, absolutely! They make looking at the sun safe and other fun things happen with the sun besides eclipses, like planetary transits and sunspots. The next transit of Mercury across the sun won’t be until November 11, 2019, and the next transit of Venus won’t be until 2117, but sunspots are pretty common. And you can see any that are at least the size of Jupiter with solar eclipse glasses. Here’s hoping everyone has a fun and safe eclipse. It won’t last very long, but at least you’ll know what a hundred-million-plus other people across the country will be doing at the same time! You can find the photos I used in the article, and many more, right here. 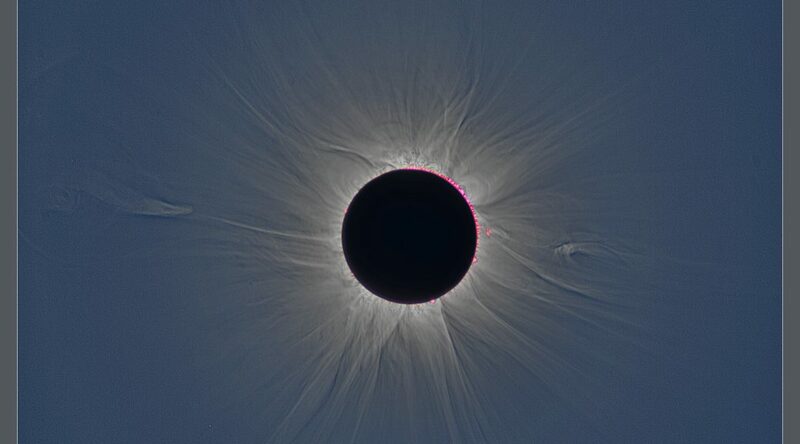 Credit for top photo of solar corona during totality: Jay Pasachoff / Allen Davis / Vojtech Rusin / Miloslav Druckmüller.